This pattern is definitely worth the money….I have used it over 8 times. 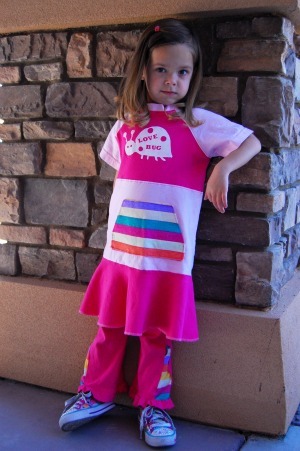 I wanted to make Eva a comfortable dress she could wear to preschool this year. I used my new Silhouette SD to cut a freezer paper stencil for the love bug. The bottom of the dress is different than the original pattern, but I wanted to have twirl bottom. If you want a basic guide to how I did it- measure the bottom of your dress (before you want the twirl) and then use the tutorial from MADE on how to cut the circle skirt part. 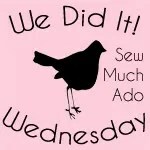 Use the measurement of the bottom of the dress as your “waist.” I did have to play around with it a little, decreasing the waist measurement 1-2″ because of the stretch of the knit I was using. I also added a large two hand pocket in the front because she loves pockets. I used one of her dresses as a guide for the pocket size and placement. If only I could get a more cooperative model 🙂 Boy, getting this picture was more work than making the dress!